Birder of the Year contest! The November/December issue is on its way to mailboxes now, and it includes a ballot for each subscriber to cast a deciding vote in WildBird' annual Birder of the Year contest. Who will you choose? Could your name be on the ballot next year? In each issue of WildBird, we pose a question in the Lister's Forum and Birder's Back Yard departments. Readers who provide timely responses might see their replies in a future issue, and they might be named that issue's Forum Birder or Backyard Birder. Those birders receive certificates and prizes from sponsors, such as Swarovski Optik and Houghton Mifflin Harcourt. This year's Forum Birders and Backyard Birders became eligible for "Peterson Field Guide to Birds of North America," donated by Houghton Mifflin Harcourt, as well as a Swarovski gift. The 2008 Birder of the Year -- Connie Kogler of Loveland, Colo. -- also received a Swarovski 8x32 EL and a guided trip to Costa Rica, courtesy of Swarovski Optik North America. Her report appeared in the September/October 2009 issue on page 4 and online. If you'd like the chance to win optics and a five-day guided birding trip with Swarovski and WildBird hosts, then answer the questions in Lister's Forum and Birder's Back Yard in every issue. As little as 250 words could earn you the trip of a lifetime! deadline: "I and The Bird" carnival! Did you do it already? Did you send a summary of and the hyperlink for your best recent blog post to Summer? Your carnival host depends on participants to send submissions in a timely manner, so hop to it if you want to see your post appear in Thursday's carnival! Wandering Eye showcases your photos! Want to show off your top-quality bird photos to WildBird's 80,000-plus subscribers? We've got the department for you: Wandering Eye. Submit a 300dpi JPG with a 4x5-inch print size and a detailed caption to wildbird@bowtieinc.com. The e-mail's subject line should read Wandering Eye. Also provide your full name and mailing address so we can send a complimentary copy of the magazine and a commemorative certificate if your photo appears in a future issue. * Ensure that you send a high-resolution image: 300dpi. * Double-check that the file's print size is 4x5 inches or larger. * Understand that 72dpi files cannot be printed in the magazine. * Scrutinize the image for tack-sharp focus, clean background and good action. 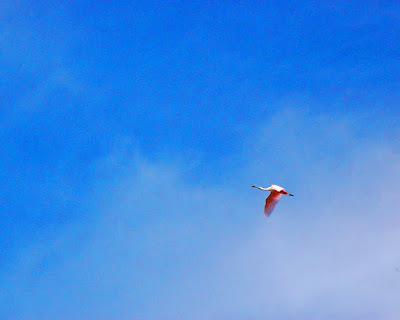 If your bird photo appears in WildBird, it also might join the Wandering Eye photo album on WildBird's Facebook page. 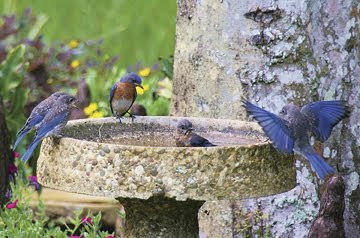 Above: Myrna Erler-Bradshaw's photo of Eastern Bluebirds was published in the September/October 2009 issue. 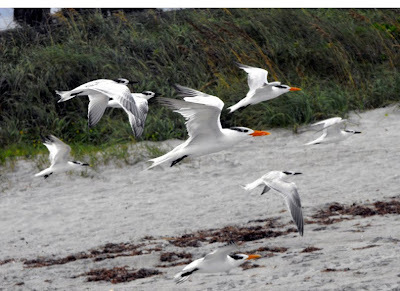 Do you have a favorite national park or national wildlife refuge? Maybe you'll see on the tail side of a quarter after April 2010. That's when the America the Beautiful Quarters Program will begin producing 56 coins with a national park, refuge or forest on the reverse sides. The first quarter will highlight Hot Springs National Park (Hot Springs, Ark. ), which was established as Hot Springs Reservation in 1832. A new coin will appear 10 weeks later for the next 11 years. The 56 designs encompass a site from each state plus the District of Columbia and five U.S. territories: the Commonwealth of Puerto Rico, Guam, American Samoa, the U.S. Virgin Islands and the Commonwealth of the Northern Mariana Islands. The complete list of parks, refuges and forests appears here. 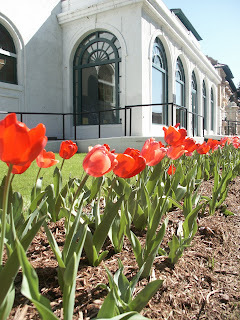 Above: In 2007, the planting of Maurice tulips commemorated the 175th anniversary of the creation of Hot Springs Reservation. How many birders know about AOU -- American Ornithologists' Union -- and its work? Are you a member? Do you know about its annual meeting in August? 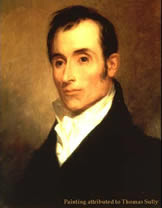 This year's meeting took place in August in Philadelphia, considered by some as the birthplace of birding due to the work of ornithologist Alexander Wilson (right). 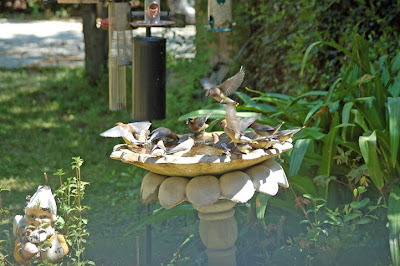 In case AOU and its meeting flew below your radar last month, the scientists with Cornell Lab of Ornithology provided blog posts that appear on Round Robin, the lab's blog. All told, Cornell scientists offered four peeks into the meeting's content. Dr. Elise Ferree shared insights from Wednesday's workshop about innovative ways to teach ornithology. Dr. Caren Cooper went to a Thursday session called Anthropogenic Structures, "which is how ornithologists refer to birds hitting things that people have built." Lab director John Fitzpatrick wrote about a Thursday symposia on "conservation-reliant species" -- those that depend on human intervention to avoid extinction -- and in particular Kirtland's Warbler. Dr. Colleen McLinn shared many points from the Friday keynote address about bird brains and song learning. Do you know which three groups of birds are capable of vocal learning? Birders in and around Orange County, California, might want to reserve some time on Saturday, Sept. 26, to visit Huntington Beach's Shipley Nature Center between 9 a.m. and 4 p.m. The annual native plant sale will include more than 100 species, advice from master gardeners, composting exhibits, literature and books, and refreshments. At 10 a.m., a program called "Bee Wise" will discuss the benefits of bees in home gardens. All this will take place within the center, located in Central Park. 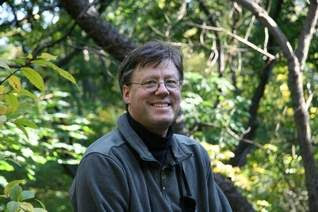 At Drew University on Tuesday, David Allen Sibley -- author of the new "The Sibley Guide to Trees" will lecture on "The Art of Identification" at 7 p.m. in the Dorothy Young Center for the Arts Concert Hall. After speaking, Sibley will take questions and sign books. "Art has always been about understanding things," says Sibley, a resident of Concord, Mass. "Drawing forces me to look at things closely. I have to look at every part of it. If art has taught me anything, it's how important drawing is to understanding what things look like and how they fit into the bigger scheme of things." 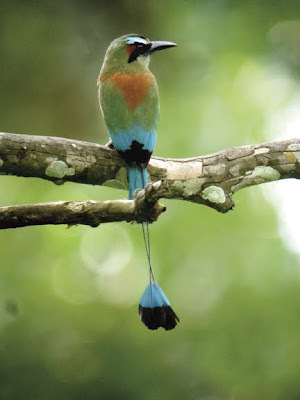 Curious about the sights and scenes savored by birders around the world? Every other Thursday, you can sample snippets from your peers' birding experiences via I and the Bird. Ambika hosted this week's edition of the carnival at Madras Ramblings -- and did so with rhyme! More than 20 bloggers -- ranging from California to India to Australia -- contributed to the carnival. Want to peek at your birding peers? As a bonus, when possible, the post includes photos of the participating bloggers. Always nice to put a face to a name! The next carnival will appear on Oct. 1. To participate, send a link to your most recent post to Summer before Sept. 29. Mark the deadline on your calendar! WildBird holds a photo contest each year that generates hundreds of entries. We love seeing so many birders respond to the prizes available in each category, and this year's contest offered 16 prizes. Tip: Look for a highlight in the bird's eye. An all-black eye can detract from an image -- even make a bird look dead although it's obviously alive and in motion. That extra spark in a bird's eye can make an image stand out among comparable photos. Tip: Ask if your photo might be a cliche. Did you take it at a location well-known for a regularly occuring event? 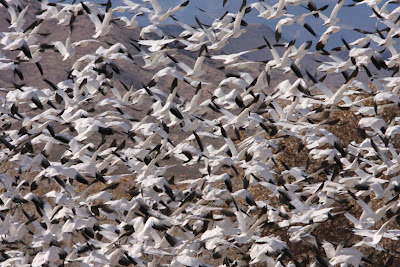 Could a contest judge look at your photo and immediately think, "Ah, another Snow Geese lift-off at Bosque del Apache"? Impress the judges with an unusual perspective on a recognizable scenario. Tip: Try to position yourself to reduce distractions in the background and foreground. I'd like to see this birdbath without the multiple feeders in back, but I like the gnome's whimsical presence. Tip: Consider filling the frame with more of the bird.